Mothering Sunday falls on the fourth Sunday in Lent – this year on March 31 – and historically was a time when children who lived and worked away from home would visit their home church and their family, taking a gift for their mother. Traditionally it is said that the gift would have been wild flowers picked from the hedgerows. Much better that we leave the flowers to grow where they are and instead take homemade daisy cakes as a gift. These are also good if you are looking for a fun activity to do with children on Mothering Sunday; the decoration requires a little concentration, which might provide a few minutes of quiet and calm! 1) Pre-heat oven to 150C / Gas 2. Put 20 muffin cases into 2 x 12-hole muffin tins. 2) Beat together the butter, marzipan and sugar with an electric whisk, until pale and fluffy. 3) Add the flour and eggs and beat together. Stir in the milk and vanilla extract; the mixture should have a soft dropping consistency. 4) Reserve 20 cherry halves for decorating, then stir the remainder, with the sultanas, into the mixture. Spoon mixture evenly into the muffin cases. 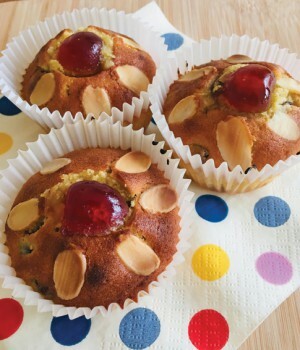 5) Arrange the flaked almonds in flower shape on the top of each cake and place a cherry half in the centre. 6) Bake in the pre-heated oven for 20–25 minutes until golden brown. 7) Cool slightly on a wire rack.